Pets are our families, they need lots of love. We should be done regularly to keep the pet's coat clean and healthy. Pet grooming is an important way to keep our pets healthy. ★All-In-One Self Cleaning Slicker Dog & Cat Brush- for Long, Medium, Short, Thick, Wiry or Curly Hair. 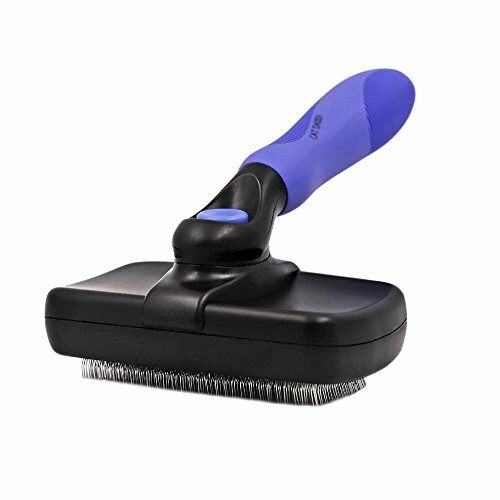 The pet portal self cleaning slicker brush is the perfect brush for your dogs and cats. It is able to effectively remove mats, tangles, dirt and loose fur from your pet's coats with minimal effort. With short gentle strokes, the Shedding tool reaches deep under your pet's topcoat to remove loose hair and undercoat without cutting hair or injuring the skin. Warning：Please keep it away from Children or Pets without supervision. Why waste time and money for pet grooming services when you can DIY from the comfort of your own home? Build a special bond with your very special friend through daily brushing sessions that will improve their hair & skin health. Invest in the quality pet brush! We're so sure you and your pet will love this brush that we're offering a no-questions-asked money back guarantee! In case of any problems, feel free to contact us for a quick, hassl-free refund. So, what are you waiting for? Click "Add to Cart" now for a risk-free purchase! ★Stainless Steel Pins: Fine bent high density bristles, go deep into your pet's thick hair without scratching their skin! Gently removes loose hair while eliminating tangles. ★Ergonomic Handle: Comfortable and durable for holding. The non-slip grip makes grooming easy，ensuring a safe shedding experience for you and your cats or dogs. ★Cleaning Function: Just press the button again to retract bristles back into the brush, the hair hiding in the pin will fall off easily. Effectively remove loose fur. ★LIFETIME WARRANTY: If you don't love it, you get a full refund. No questions asked. If you have any questions about this product by CAT DADDY, contact us by completing and submitting the form below. If you are looking for a specif part number, please include it with your message.